You can’t dissociate Arma from its terrain. Players joke about Arma and DayZ being “walking simulators,” but the reason they make that crack at all is because of how well most of Arma’s stock and player-made maps hold up as authentic-feeling spaces despite the fact that they’re often hundreds of square kilometers big. At our PC Gaming Show today Bohemia officially revealed their next terrain for Arma 3, Tanoa, a South Pacific setting coming in Arma 3’s first expansion in the first half of 2016. Bohemia describes Tanoa as “a South Pacific archipelago with a land mass of over 100km2, and home to lush tropical vegetation, unique landmarks, a rich history, and imposing man-made feats of modern engineering.” It’ll be bundled with new vehicles, weapons, gear, attachments, and more with Arma 3’s first expansion, which will be distributed as Arma 3 DLC, meaning it won't be standalone. Lush. A far cry from Arma's often foliage-sparse landscapes. 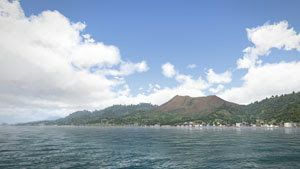 This is the first time Arma has, outside of user-created mods, been set in the South Pacific. And although we can see a small variety of terrain types in the trailer, I’m most curious about how Tanoa’s dense jungles will influence firefights. Bohemia will almost certainly need to add new equipment (and perhaps vehicles) to help players manage the limited visibility in these areas, but this could be the first time that players (and AI) have large brush-covered areas to effectively hide in. Secondary to that, I’m excited about the idea of island-hopping on rafts between missions. Vacation in beautiful, embattled Tanoa.